Fruit Flummery – passionfruit OR rhubarb, garnished tastefully with a flitch of mint, a fillet of fig and maybe even a (f)berry. 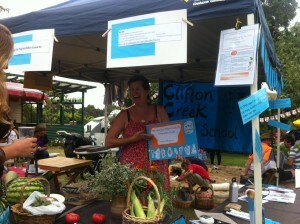 Grown & prepared in the fabulous garden & kitchen at Clifton Creek Primary School. Are you still considering educational options for your children? Clifton Creek Primary School offers something unique, so don’t fiddle faddle around – just come out to see learning in action at CCPS for yourself.